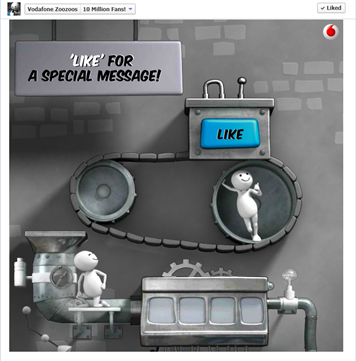 Vodafone Zoozoos are celebrating 10 million fans on Facebook. The achievement doesn't come as a surprise considering the popularity of the characters. Big credit also to the well managed content on the Facebook brand page, one of the few that stick to the brand ethos and are prolific with quality posts and specially created web content. Is there any other brand in India that has managed this feat? I doubt it. The Thank You video series created especially for this occasion, play on the ‘Facebook Likes’ premise and are clever as usual. Check out the superbly executed App page on Facebook and a video below. Enjoy! The extended celebrations include promotions via sponsored post on Facebook and video masthead on Youtube. Facebook does the same thing and has more than 49,253,000 fans.